The advantages of multispecies pastures have been proven over the past few years through numerous studies. They play a crucial role in soil amendment and thus improve soil health. Added to the improvement of the health of the soil, the planting of multispecies pastures has contributed to farm profitability, especially the inclusion of legume species. 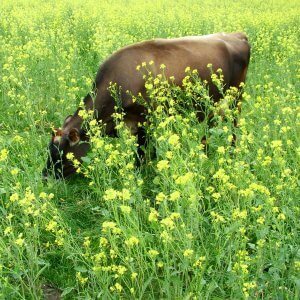 I have compiled five of the main benefits of planting multispecies pastures, and how they contribute to improving farm profitability. Diverse pastures improves underground microbial diversity. Nature functions without any external additions of nutrients. By using multiple pasture species you can get as close as possible to mimic what nature does. 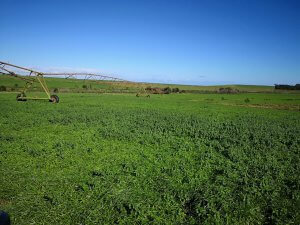 The introduction of a variety of pastures species creates above- and below-ground leaf and root diversity. Below ground, this diversity encourages microbial diversity. 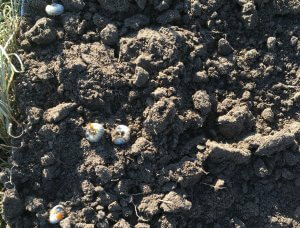 A diversity of microbes is crucial to the mineralisation process, which releases plant-available nutrients in the soil. In nature, nutrients are supplied to plants through the natural process of mineralisation rather than through the external addition of nutrients. The optimal occurrence of this process is subject to a balanced soil food web. 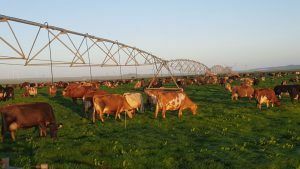 In essence, multispecies pasture helps to encourage the process of mineralisation, by creating ideal conditions for a diverse, balanced soil food web to thrive. Black maize beetle larvae, a pest that is common to pastures. Not only do multispecies pastures diversify the roots in your soil, but they also increase the number of good guys in your soil microbial population. Yes, you heard right, diverse roots make sure that no pathogens formed against plant roots can prosper. But how do they do this? Well, the answer is complex, but in a nutshell, microorganisms like fungi (the king of microbes) create a barrier around and within the plant roots that protect the plant against any potential root feeders. There are also some microbes, such as nematodes and protozoa, which feed primarily on root-feeding nematodes and pathogenic bacteria, keeping them in check. Additionally, a diversity of plants helps to reduce the potential outbreak of diseases specific to one crop type. This is probably the most compelling reason to me. As humans, we enjoy a balanced plate of food right? We want our food to have carbohydrates, proteins, fats, minerals, vitamins, etc. as this ensures a healthy, balanced diet. Well, it is the same for the cow. A diversity of species on a pasture does just that for the cow too, it ensures a balanced diet. 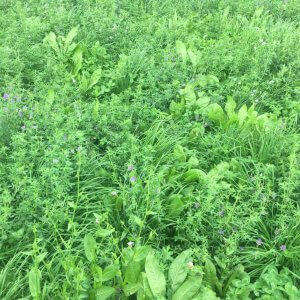 A diversity of species also thrive under differing conditions, so having many pasture species will result in good pasture growth throughout the year. This, along with the more balanced bite, should decrease the amount of supplementary roughage and concentrates you need to feed, saving you money. Stinging wattle weed common to pastures. Along with improved soil health, weed suppression is improved too. Here’s how. Weeds thrive under poor soils with low fertility; therefore improving your soil’s fertility is the first defense mechanism against weeds. The second mechanism is through the strong allopathic chemicals (allelochemicals) that some pasture plants possess. Allelochemicals, simply known as plant-on-plant poison, differ in their quantities and weed suppressing ability. They are spread by leaching through the soil, volatilisation from the leaves and exudates from roots. Plants that are known to contain allelochemicals are oats, stooling rye and some Brassica (e.g. turnip and kale) and Trifolium species (e.g. clover). Multispecies pastures help in making a farm more productive. This happens through improved pasture quality and potential biomass which reduces feed costs. Furthermore, fertiliser costs are also reduced through improved soil fertility and overall soil health. The two, feed and fertiliser actually take about 70% of the farm budget. A reduction of these two costs, while still maintaining the quality of pasture, will help a farm to be more profitable. The benefits of multispecies pasture are not only limited to the above-mentioned points, they are far greater. I have isolated these ones because I feel they are the most pertinent and directly relate to farm profitability. So, in a nutshell, this is what multispecies do for you: by mimicking nature they help reduce your fertiliser costs, they provide natural protection to pasture plants, the balanced pasture diet reduces feed costs, and improved weed control reduces herbicide costs. It all boils down to one common benefit which is increased income per hectare. Milk, is it really just milk or so much more to it? Sustainable food production: Is agriculture playing its part?